Wieden+Kennedy and production house Laika have won a Titanium and Integrated Silver Lion at Cannes International Advertising Festival 2009 for their promotion of Coraline, a 3D stop motion animated feature film. Coraline, based on a book by Neil Gaiman, was directed by Henry Selick. Coraline Jones uses a special key to enter an alternative world in which her safety is threatened by her Other Mother, a woman who sews buttons over the eyes of her victims. The film was released widely in US theaters on February 6, 2009, after a world premiere at the Portland International Film Festival. Wieden+Kennedy developed a fully integrated three-tiered strategy to take interest in the film beyond the immediate community of eight-year-old fans of the book. Phase one activated online communities to build a foundation of support. Phase two created intrigue on a mass scale and introduced mysterious elements of the film into the real world, driving people to our website to learn more. Phase three created mass awareness for the film and its launch date. The creative team hand-made fifty one-of-a-kind boxes, filled with desirable relics from the set of the movie and sent them to their influencers, (Gaiman fans, Selick fans, animation fans, crafters collectors, goths etc). 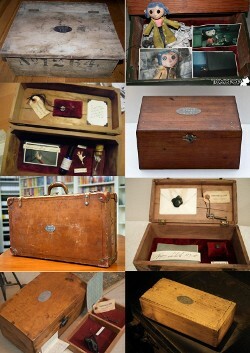 Each box was designed with that of a single influencer in mind and included secret passwords that unlocked exclusive short films about the movie on Coraline.com. A large number of these recipients shared the gift with their online network. The exercise sparked off another Coraline Boxes ring, in which people voluntarily signed up to make their own Coraline boxes and send them to others. One week prior to launch, two of the five sites driving the most traffic to Coraline.com were talking about the influencer boxes and estimated online impressions directly linked to the boxes were 1,898,000. Of all the estimated online impressions over the course of the campaign, approximately 30,000,000 occurred before Coraline’s theatrical release and can be attributed to the campaign. Number 39 at Karrie A Lyons, Tim Burton Collective. So what happened to Coraline Boxes 12, 16, 17, 18, 19, 20, 25, 26, 30, 31, 32, 35, 36, 38, 43, 45, 47, 48 and 49? Perhaps these were people of offline influence! In addition, W+K sent “button boxes” from Other Mother’s Workshop to another set of 300 interested recipients. 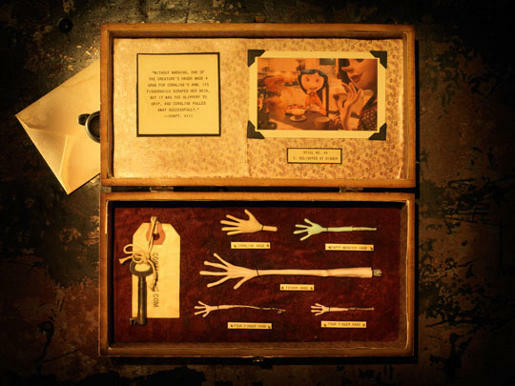 To create intrigue about the film the creative team made thousands of skeleton keys with the web site address, “coraline.com”, mysteriously placed them in major metropolitan cities throughout the U.S. The Keyhole website rewarded keyholders with a short film, Miniature Knitter. Further short films included Biggest Smallest Movie, Lady Puppets, Magic Gardener, Moustachio, Puppet Breaker, Puppet Point of View, Really Small Hair, and Skeleton Maker. “Wild Postings” were embedded in the offline world. In Store interactive displays included Meet The Cast, Bobinsky’s Circus, Button Eye Portrait, and Ghost Children Hologram. The team even connected the movie with Dunks, shoes designed by Nike. Coraline.com visitors reached 845,000 before the movie’s release, more hits than three comparable movies opening during that same time period, combined. The best news came during opening weekend. Projected to make $9 million, it made $16.8 million and within its first month became Focus Features’ second highest grossing film ever, pulling in a much larger contingent of the moviegoing public than eight-year-old girls. Other phase two elements included interactive storefronts, subway zoetropes, a creepy inflatable character that haunted a NY sidewalk at midnight, a fully explorable website. The website for Coraline involves an interactive exploration game where the player can scroll through Coraline’s world, along with a Tumblr blog written by one of the characters from the film, Bobinsky’s Circus. The site won the 2009 Webby Award for “Best Use of Animation or Motion Graphics,” both by the people and the Webby organization. It was also nominated for the Webby “Movie and Film” category. 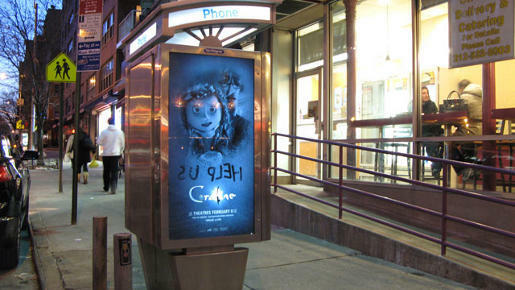 The Coraline campaign culminated with the release of trailers, online banners, cinema, out of home, newspaper and lenticulars, as well as original content for the web and cable networks (IFC and HBO). The Coraline campaign was developed at Wieden+Kennedy by executive creative directors Susan Hoffman and Mark Fitzloff, art director/copywriter Wk Five, studio manager Maya Roberts, designer Paul Levy, account director Ken Smith, strategic planner Matt Kelly, roducer Jennifer Fiske, digital director Sean O’Brien, executive interactive producers Marcelino Alverez and Kris Hanson, interactive producer Jeremy Lind, and W+K Entertainment president Bill Davenport. The Laika team included chairman Phil Knight, CEO Travis Knight, director Henry Selick, producer Claire Grossman and animator Suzanne Twining. 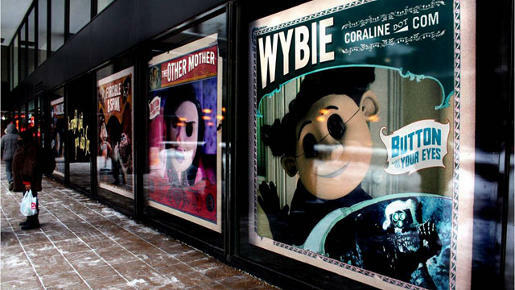 See more on the Coraline campaign at Wieden+Kennedy.